Union Home Minister Rajnath Singh on Sunday addressed Jammu and Kashmir Police and the CRPF and announced a few measures for them, on the second day of his four-day visit to the state, and also met a delegation of opposition National Conference, led by former Chief Minister Omar Abdullah. As the Union Minister visited Anantnag for his meetings, an overnight gunfight between security forces and militants in Shopian district left two militants dead, while one surrendered. 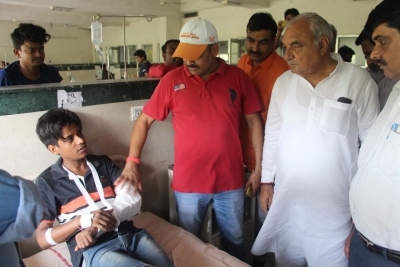 The Union Minister, who met 24 delegations on the first day of his visit on Saturday, including boatmen and artisans, has said he is visiting Jammu and Kashmir with an open mind and was willing to meet with anyone who could help in finding solutions to the Kashmir issue. He leaves for Jammu on Monday. Singh’s visit comes as former Prime Minister and senior Congress leader Manmohan Singh arrived in Jammu, heading the party’s policy planning group on Jammu and Kashmir, in an effort to bring peace in the state. Earlier in the day, the Home Minister addressed a ‘Darbar’ (gathering) of local policemen at the district police lines in Anantnag district, and later a Sainik Sammelan at the Khanabal headquarters of the 90th battalion of the Central Reserve Police Force. He said his ministry has allotted funds for opening of a trauma centre and purchase of bullet proof vehicles for personnel of J&amp;K Police. While meeting the CRPF, Singh said his aim is to provide Rs one crore as monetary relief to the families of personnel of central armed forces killed on duty. “It is my aim that at least Rs one crore should be given as monetary relief to families of martyrs of our central armed forces personnel. Praising the valour of CRPF personnel doing counter insurgency duties in the country, the Home Minister said: “We are proud of our CRPF personnel. Courage cannot be purchased from any market. You are born with unassailable and unmatched courage”. Later, a delegation of National Conference met Rajnath Singh here asked him to translate Prime Minister Narendra Modi’s words of embracing Kashmiris with love into reality. In Shopian, security forces gunned down two terrorists – identified as Altaf Ahmad Rather and Tariq Ahmad Bhat – while the third one identified as Adil Hussain Dar surrendered.